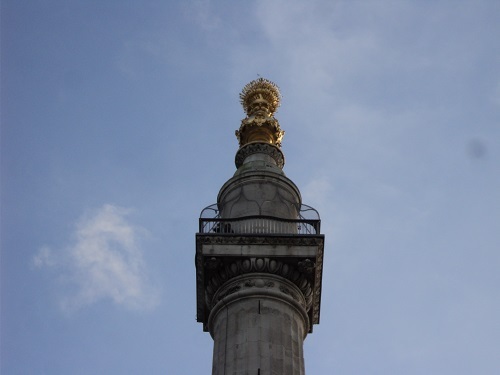 Although dwarfed by the skyscrapers of the City of London, The Monument to the Great Fire of London was one of its wonders of its day. 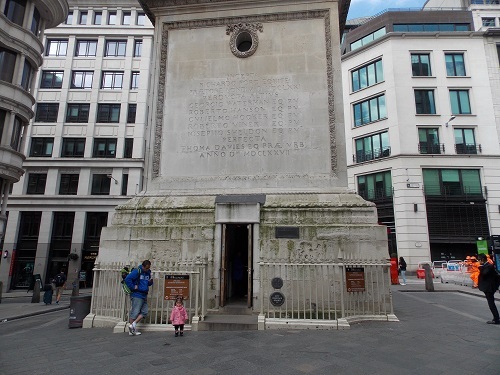 The Monument stands at the junction of Monument Street and Fish Street Hill in the City of London, it is 202 ft (62 m) tall and 202 ft (62 m) from the spot in Pudding Lane where the Great Fire of London started on 2 September 1666. 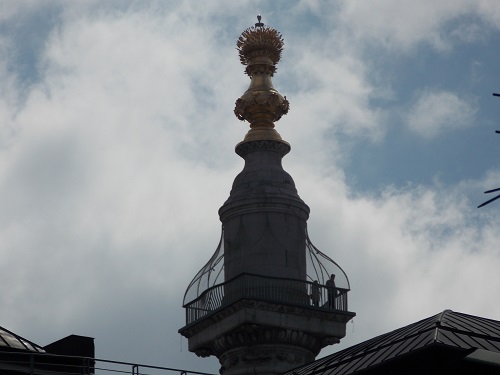 It was built between 1671 and 1677 as a permanent memorial of the Great Fire of London and to celebrate the rebuilding of the City. Sir Christopher Wren, Surveyor General to King Charles II and the architect of St. Paul’s Cathedral, and his friend and colleague, Dr Robert Hooke, provided the design for a colossal Doric column. Inside the column contains a stone staircase of 311 steps leading to a viewing platform. This is surmounted by a drum and a copper urn from which flames emerged, symbolizing the Great Fire. 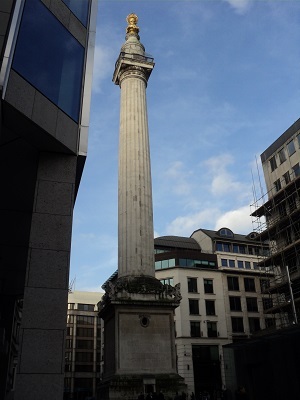 As well as enabling visitors to the column to have a unique view of the City of London, Wren built a shaft to enable the Royal Society to conduct experiments into gravity and pendulum movement. The instruments in the shaft connected to an underground laboratory but ultimately the heavy traffic on Fish Hill rendered the experimental data unusable. The viewing platform at the top was originally open, however a mesh cage was added in the mid-19th century to prevent people jumping off, after six people had committed suicide from the structure between 1788 and 1842. There was also an occasional accident, in 1750 William Green, whilst reaching over the railing of the balcony to look at a live eagle kept there in a cage, accidentally lost his balance and fell over to his death. 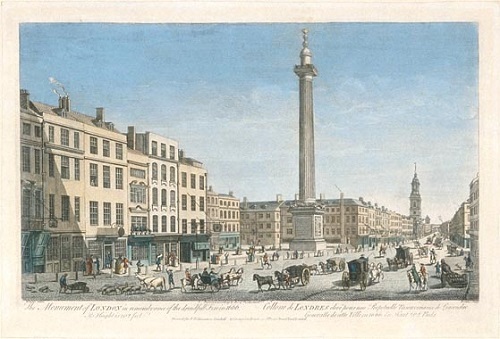 The Monument was not without its controversy when inscriptions added on the east side seemed to blame Roman Catholics for the fire, these offensive words were finally chiselled out in 1830. In many respects, the Monument was the Shard of its day and was visited by thousands of people every year. Built from Portland Stone it managed to survive the bombing of the Second World War with minor damage. 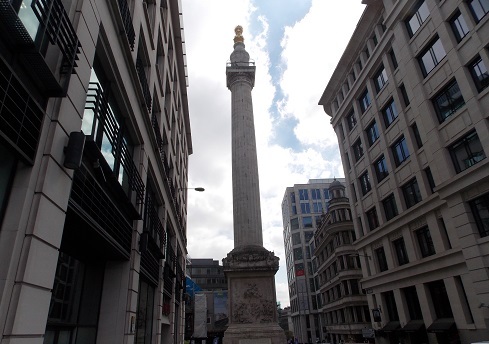 There may be taller structures in London but the Monument is one of the oldest and most interesting historically. It is also one of the cheapest with tickets only £4 for adults and £2 for children. By londonvisitors2014 in Hidden London on April 23, 2015 .